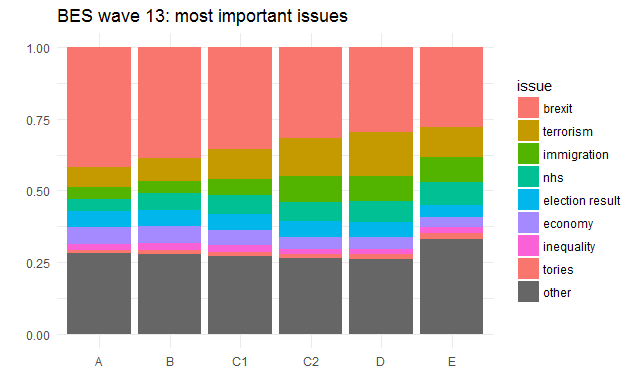 Brexit comes top in every group, but as we move across the social grades from A to D, the proportion of respondents giving it as the most important issue declines and the proportion of respondents giving terrorism or the NHS as the most important issue increases; social grade E continues this trend with regard to the NHS, but reverses it with regard to terrorism. More respondents in ‘working class’ social grades (C2DE) than in ‘middle class’ social grades (ABC1) cite immigration as the most important issue, while fewer cite inequality (which in the recoding scheme used here includes poverty and homelessness) or the economy (which in the recoding scheme used here includes employment, unemployment, cost of living, and wages). More respondents in the lowest social grade (E) gave ‘other’ responses, i.e. answered in ways in which very few people answered overall. Unpicking answers outside the top eight is problematic: although this was a very big survey, even the ninth most commonly chosen ‘most important issue’ overall (i.e. the environment) was cited by a mere 286 people, and — to make matters worse — grade E had the fewest respondents overall. Because many respondents expressed the same ideas in different ways (or mis-typed the same words), it was necessary to do quite a bit of re-coding before visualising the data. If you want to see how this was done and what decisions I made, you can take a look at the R notebook I used. Previous Previous post: Did Jewish Labour voters turn towards the Conservative Party or the Liberal Democrats in 2017?